Do Wezarp and Takemote work over internet? They do work over internet configuring your router with a redirect-gateaway or VPN connection. Fo more information, contact your IT administrator. Does Wezarp Client can be used with TAKEMOTE? Yes, Wezarp Client is needed to control any Windows application selected thanks to TAKEMOTE settings. 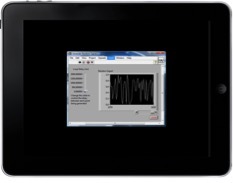 Since Wezarp for LabVIEW 1.3.0 it is possible to manage Multiple Front Panels. 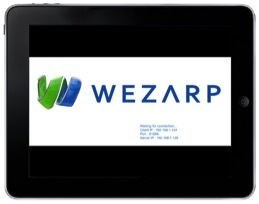 Download and install Wezarp app from Google Play. The Android Tablet or Smartphone has to be connected on the same local network than the server(s). In order to set the server(s) IP address(es), make appear the app settings by sliding with one finger from the left border side to the center. The port must be the same than the server one. We can distinguish two kinds of user events. Events which have to be transmitted to the server and events related to display management. Difference between both events is managed by the number of touches. The accuracy required for mouse gesture imposed that events transmitted to the server are single touch events. Multiple device orientations and zoom are also supported. The iPad or iPhone have to be connected on the same local network than the server. In order to set the server IP address, go to the app settings. The port must be the same than the server one. We can distinguish two kinds of user events. Events which have to be transmitted to the server and events related to display management. The difference between both events is managed by the number of touches. The accuracy required for mouse gesture imposed that the events transmitted to the server are single touch events. 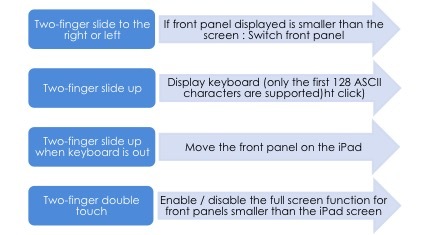 Multiple device orientations and zoom are supported. When installation is completed, the following shortcut appears on your desktop. Launch the application and a pop-up window and an icon in Windows taskbar appear. 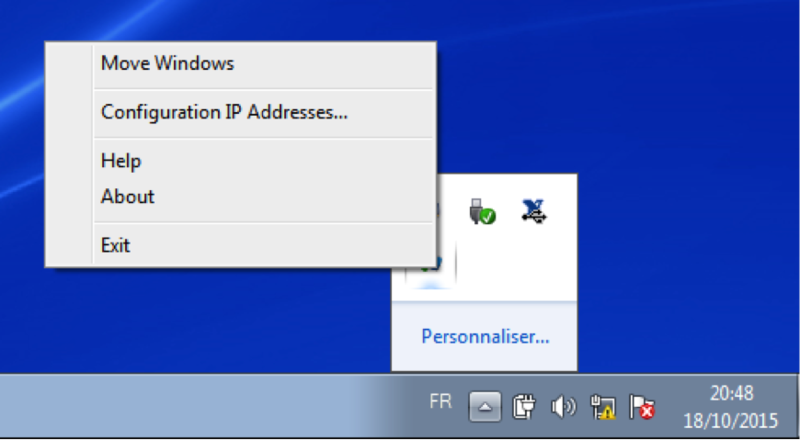 The pop-up window indicates client and server IP addresses. Right click on the icon to access the application settings. Allows to move window as described before. 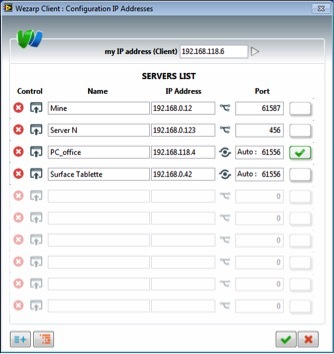 Open a popup window for advanced IP configuration. 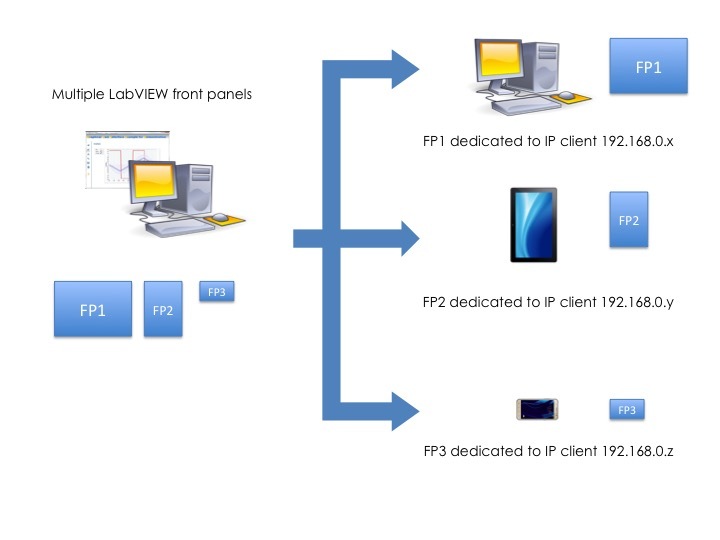 Displays IP addresses (server and client) currently used and software version. You can move the position of windows by selecting “Move Windows". All front panels are disabled and grayed out with a cross shaped blue icon in the center. You can move front panels by clicking left and holding down while moving. By releasing, it becomes enable. Move every front panels or uncheck “Move Windows” to come back in standard mode. 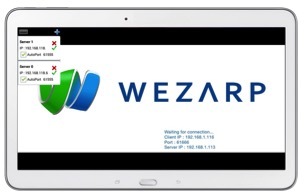 The Windows device which runs Wezarp client has to be connected on the same local network than the server(s). The current Client (my IP address) used is displayed at the top. By default, the port is automatically set to 61550 + last client IP number. If you have several Network Interface Card, you can swap your IP address to use by clicking on “my IP address (Client)”. If you specify a different port value manually. You have to define the same port on server side. Click on button to specify the IP Address and port of the new server. Then, click on validate to apply and make it appears in the list. Click on button to erase full servers list. Then, click on validate to apply and erase the list. Click on validate to apply the new configuration. May I insert Wezarp Server in multiple programs on the same server computer? NO you can't (this feature is on our road map). Regarding LabVIEW, If you need to run multiple programs on the same server computer without building any exe files (ie. 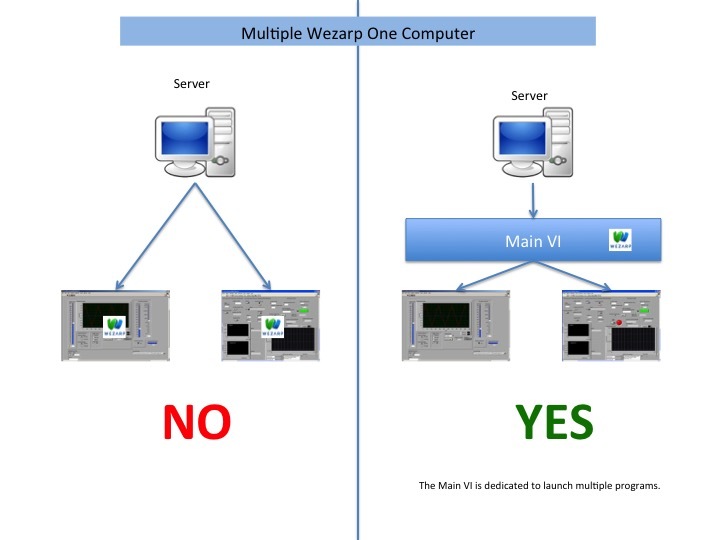 in the LabVIEW Development System) and have the ability to control them with your remote device, you will need to create a « Main VI » dedicated to launch multiple programs with Wezarp server into its diagram only. 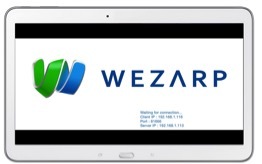 See the « Multiple Wezarp One Computer » image below. 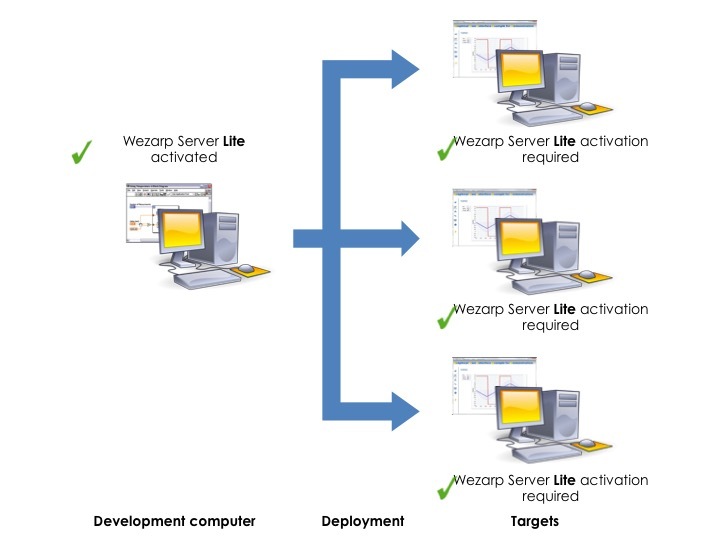 What is the difference between Wezarp Server Lite and Pro? One license is dedicated to one developement computer and allows compilation and deployment of unlimited applications. 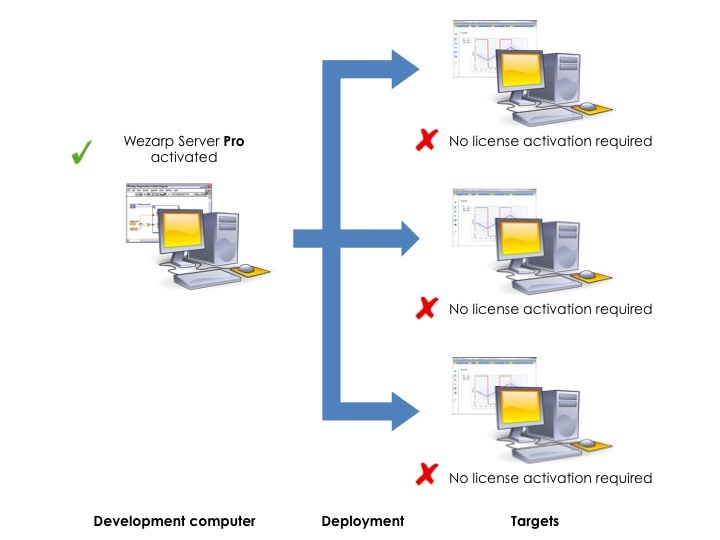 The deployment of your application will use Wezarp on each target computer without any activation required. One license is dedicated to one computer. 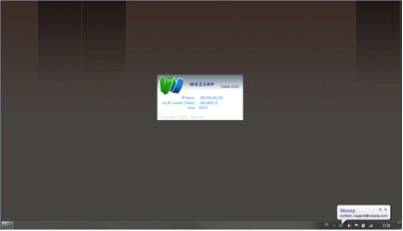 Wezarp Server Lite is dedicated to a computer using Wezarp technology if Wezarp Server Pro has not been activated. 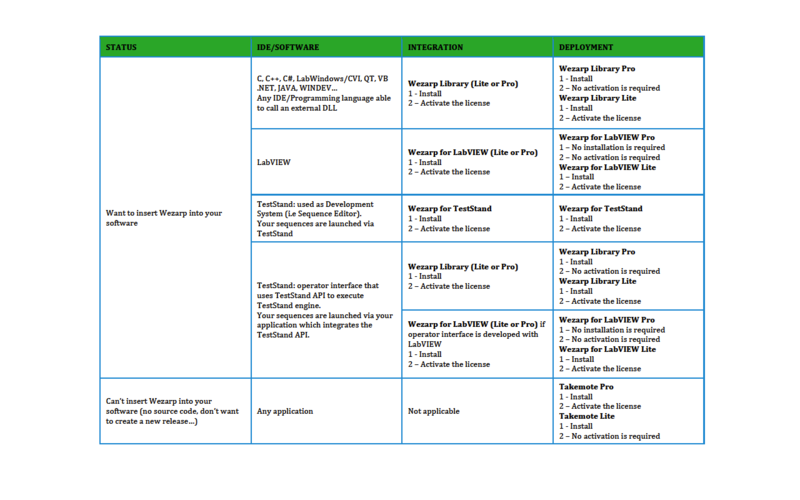 If you need to deploy your application that embeds Wezarp technology, you will also have to activate a Wezarp Server Lite license on your target computer. Which Wezarp Server do I need? Why nothing happens after setting IP address? To establish the first connection, make sure the application running on the server is active and in the foreground process. If no tooltip appears on server side indicated that a new client is detected ; it probably comes from a fire wall non authorization on the server and/or client. On server side: Configure the firewall to authorize the exe program using Wezarp or Wezarp server for the dedicated IDE. 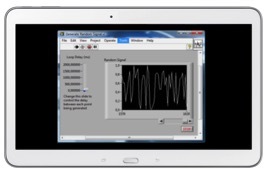 If Wezarp for NI LabVIEW is used, authorize LabVIEW Development System.